The Pentagon follows a six-step process that can go as high as the president of the United States before launching an aerial strike against a suspected terrorist target, according to military documents filed in a federal court in Washington. Those six steps are identifying targets, determining whether they are fully developed as a threat, evaluating whether intelligence supports the targeting, considering whether eliminating the target will further U.S. interests, weighing domestic and international laws to determine what rules apply and concluding with a final action and analysis, according to the briefing document prepared by the Pentagon's joint staff last November. According to the Pentagon document, titled "Joint Targeting Cycle and Collateral Damage Estimation Methodology," while an aerial attack during the Vietnam War would cause collateral damage up to 400 feet from its intended target, that range has been cut to 40 feet now, the report says. That's because of improved bombs and missiles that carry smaller payloads and have more sophisticated guidance systems. Military commanders and analysts also have an extensive list of "no-strike" targets, including religious centers, medical facilities, schools and public utilities. Striking such targets requires the approval of either the President or the Secretary of Defense. The increased use of drones has been an integral part of the Obama Administration's counter-terrorism policy. Earlier this year, CIA Director Leon Panetta reported that "those operations are seriously disrupting al-Qaeda…It's pretty clear from all the intelligence we are getting that they are having a very difficult time putting together any kind of command and control, that they are scrambling. And that we really do have them on the run." But the successes of the program have not come without criticisms. The Pentagon document was filed in court last week by the American Civil Liberties Union (ACLU) in its ongoing challenge to the Obama administration's drone program and the alleged targeting of al Qaida in the Arabian Peninsula (AQAP) leader Anwar al-Awlaki. On Aug. 30, 2010, the ACLU filed suit in federal court in DC on behalf of Nasser al-Awlaki, Anwar's father. The case challenges the government's authority to carry out "targeted killings" of U.S. citizens, such as Awlaki, and said officials, such as President Obama, are being given "sweeping authority to impose" death sentences on a U.S. citizen without legal approval. Since late 2009, Awlaki "has taken on an increasingly operational role in AQAP," said Director of National Intelligence James Clapper in a statement filed in the court case in August. 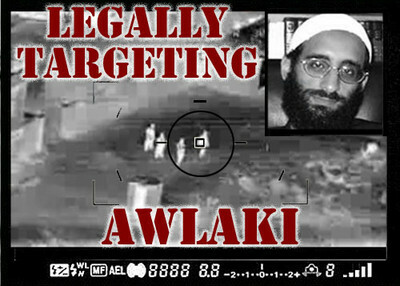 Awlaki, Clapper said, has recruited terrorists and planned and facilitated attacks in the United States and abroad. Awlaki is also a contributing editor for the terrorist organization's cyber-magazine Inspire, in which the group calls for the targeting of civilian centers throughout the United States. In one such call to jihad, the magazine says: "The ideal location is a place where there are a maximum number of pedestrian and the least number of vehicles. In fact if you can get through to 'pedestrian only' locations that exist in some downtown (city center) areas, that would be fabulous." Contrast this with the Pentagon document, whose author concludes "never before has a nation taken such measures and resources to reduce the likelihood of civilian casualties." Awlaki's father claims that his son has been added to CIA and Pentagon targeting lists using secret criteria and evidence for determining whether a U.S. citizen can be targeted for lethal action. Based on this, the father and the ACLU have asked a federal judge to prevent the government from intentionally killing Awlaki without showing that he presents a concrete, specific, and imminent threat to life or physical safety, and that there are no means other than lethal force that could reasonably be employed to neutralize the threat. On September 25, the government filed its response to the allegations, seeking to have the case dismissed on procedural grounds. And while most of the coverage of that filing has focused on the much maligned "States Secrets Privilege" (see here, here, here), that was in fact the last, fallback defense of the government. The government also argued that the father lacks legal standing to bring the suit and that even if the father was an appropriate plaintiff, the court lacked the authority to rule on the case because the "requested injunction would necessarily and improperly inject the courts into decisions of the President and his advisors about how to protect the American people from the threat of armed attacks." This latter argument, that the "targeted killing" program is not a proper exercise of judicial authority, is the most recent in the ongoing debate over what role the different branches of government have in drafting and applying national security policies. The ACLU filed the Pentagon document in an attempt to show that a federal court can play the role of the executive branch when it comes to targeting suspected terrorists. Arguing that it is evidence that there are "legal limits to the circumstances in which the government can use lethal force," the ACLU hopes the federal court will not cede judicial review of this national security tool. But as even the ACLUs own argument suggests, the targeting of terrorists is the type of activity that requires the knowledge and expertise of the executive branch. In a footnote, the ACLU says the Pentagon document "exhaustively describe[s] the process by which the armed forces select, vet, plan, approve, engage, and assess targets." The parties now await the decision of U.S. District Judge John D. Bates as he determines whether to dismiss the ACLU complaint. Awlaki is no longer andAmerican citizen. He gave it up when he joined alquaeda.